Wouldn't it be wonderful to be multi-lingual? One of my never-going-to-happen-without-a-miracle fantasies is to be able to speak and understand the language of any person that I meet. If I was an X-woman, I'd be Lingo – woman of a thousand tongues! Okay, that was only super-lame. My mother is blessed in that sense, māshā’Allāh. Other than being fluent in English and her native tongue(s) of Hindi/Urdu and Gujarati, she also knows enough Arabic to get by abroad (she picked it up in Somalia and Aden way before I was born), and a teeny bit of Persian (from her school days). How cool is that? Whereas I am only fluent in English – and even then I have my moments. I spent years learning French and Latin (yes, Latin! ), only to forget it all the moment I graduated from secondary school. A couple of years ago, I spent several months learning Arabic – at least to beginner level. Once again, all forgotten. How pathetic is that? Arabic: to develop a better appreciation of the sacred texts. Hindi: my other mother tongue; so it's kind of a “must learn”. Gujarati: this is probably more my “other mother” than Hindi; but as it is far less spoken, I personally feel that Hindi is a greater priority. Plus Hindi is very similar to Urdu, which means it would be a two-for-one deal – bargain! Sign – I would LOVE to learn sign language! In fact, I just begged a friend of mine to sign up to this online BSL course I found tonight. I have no idea if it is any good… if we sign up, I'll write a review, inshā’Allāh. Pah! Who am I kidding?! I have been making an effort to learn more languages. I have picked up a few Polish words just for the fun of it from a Polish coworker. Migdaty means almonds. Apparently it’s one of the hardest languages in the world to learn for an English speaker, and that has become quite evident to me. One of Batman’s impressive skills is multilingualism, so it’s not a lame power. He combines this with his wealth and technology, intellect, fighting ability and interrogation techniques. Maybe multilingualism mixed with an ability to impersonate any voice, I could imagine a mutant named Echo (maybe a Morlock). If I was an X-woman, I’d be Lingo – woman of a thousand tongues! As for me, I’ve never been any great hand at languages… dropped French in grade 7 when the grammar got too annoying; spent 2 years doing beginner’s-level of Arabic but ended up focusing on more grammar than conversational Arabic (mind you, I can still bungle my way through the first couple phrases of an introductory conversation); and my Gujarati is pretty lame (ranks just below my Arabic). Mind you, hubby and MiL have already firmly let me know that I have no choice but to learn Arabic – both fus_ha (Qur’anic Arabic, the pure stuff), as well as Egyptian (which apparently is a whole ‘nother dialect on its own!). Not that I’m not willing to learn, but it just takes so LONG… and then there will be the inevitable embarrassing mistakes I’m going to make, which I hate! I know Farsi (all dialects), English, Gilaki (a language in north of Iran), Arabic, alittle turkish.. I started to learn Italian and Russian one upon time and i know alittle of them too. Anyway among them just Farsi, english and Arabic really are usefull for me..
There’s more than one version of sign language though, you wouldn’t necessarily be internationally understood if you learned one system. I was quite disappointed when I tried to use the little I learnt as a kid (in cub scouts, I got some badge for it) when I got over here and found that the American system (Saudis love American stuff) has a totally different alphabet from the British one I’d memorised. 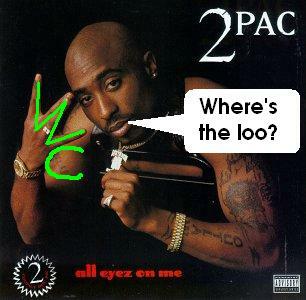 But I cheered up when I was shown the sign for WC and reflected upon how Tupac Shakur may have been misunderstood all these years and had actually been signing to his photographer that he needed to take a toilet break; rather than “throwing up” a gang sign as is often assumed. I used to be very good at Arabic when I was younger. Reading novels was easy (I think I was 10 that time), and I used to beg my mother to buy books when she went shopping. We lived in Egypt short period, and it was remarkable too see books anywhere in the marked, and almost every corner you would find book shops. I need to learn how to speak Arabic! We’re learning it in high school and it is soooo hard! We have an end-of-year Arabic exam on Monday too and I’m going to dieeeeeeeeeeeeeeee! lol, I wanted to write a post on languages too! I know how you feel. I’m pretty much the same way. Even though I can fully understand Urdu and Punjabi, I can hardly speak them fluently (especially Punjabi!) I’m only fluent in English. I know more Arabic than the average person, but I haven’t picked up on it in a while. My mother was born in Qatar and she grew up there, so she USED TO BE fluent in it, but now it takes her a while to pick up on words. Whenever she’s around Arabic speaking people, the words come back to her. I know some Farsi too, probably a little more than Arabic. It’s actually quite easier for us South Asians to learn Farsi since it is very close to Urdu. There are also NO MASCULINE and FEMININE words! I plan to change that! Btw, I have no idea about the “throwing up” sign thing…? Is that the one where someone points their index finger towards their open mouth? Your explanation is much better but this sort of thing. My knowledge of BSL is very limited but I admire that you’re intending to learn it. May Allah grant you success. I know how to sign the BSL alphabet; say “please” and “thank you”; the words for “tree” and “baby”; and some swearwords (that involve using more than two fingers) that I learnt when I saw Children of a Lesser God as a kid. It’s surprising how many times in your life being able to say “Please can I have a tree for my baby you *$£&$%^ *$^! @&?” isn’t of much use. But seriously, the “please” and “thank you” bit I’ve used a lot and I’ve spelt directions to someone before. It made me feel warm inside. Okay, so now I get it… I had that image in my mind (but not your hilarious mock up version – I missed those!). Does “throwing up” not mean vomiting in this case, but rather a “big up to ma homies” type thing? I am so not a gangsta. You are kidding only yourself. I, too, have had a deep desire to learn Arabic, and I quit after ten years of study and achieving semi-fluency. Another ten years passed, during which I did not lose the desire to study this language, so I took it up again. I told my kids, whose native language is Arabic, that they’d better help me this time, and I didn’t care if I made a fool of myself. A language is like anything else: if you don’t practice, you’ll forget. I think the advice of many Islamic scholars and teachers is most appropriate when they say not to focus on “conversational” Arabic which you’ll never get to practice with anyone and will therefore forget. Rather, focus on Qur’anic Arabic because you read, recite, memorise the Qur’an on a daily level, it really is an unmatched interaction. With that said, I would say take the Al-Huda courses if you can (in person or online). You literally go over the meaning of every single word of the Qur’an and analyze it, and then you learn the tafseer of the ayaat which only reinforces it. It’s a 1 1/2 year course and so knowledge is built soundly – a real investment because how long can you go in your life without understanding the Qur’an for yourself when Allah has made it easy to rememeber? Jazakallah for the encouragement and tips! salam, I too would love to know more languages than English (the only one Im fluent in) I learnt french to year 11 (got A* in gcse) then a 2yr conversational course when i came to canada. I did german for 1 yr in year 9 and I learnt welsh in primary school :P I wanted to study BSL too sis.. Ive been looking at arabic, but one step at a time with it (got to get the reading done first insha’allah) H2b is algerian so masha’allah hes got the language gene :( french, arabic, english, berber & spanish masha’allah :) insha’allah ill be able to pick up french and arabic easier when im married. Insha’Allah… I hope he passes that lingo gene on to your kids too, insha’Allah!